1. Boil the diced sweet potatoes until tender, about 10 minutes. Drain and mash the potatoes with the sliced salad onions, then season. 2. Next, heat the olive oil in a frying pan and fry the lamb leg steaks according to pack instructions or to your liking.Off the heat, stir in the redcurrant jelly and the chopped fresh mint. 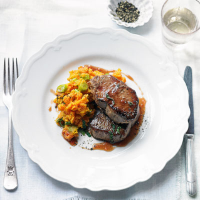 Place the lamb and mash on plates, pour the redcurrant sauce over the meat and serve. Château du Gazin 2008 Canon Fronsac Bordeaux, France, is perfect with this dish, its full of pencilly notes of cassis, plums and liquorice.